The Silverfields Mill and the tailings from the mill, in Cart Lake, are more recent that most others in the Cobalt area. The mill operated from 1965 until 1983. Tailings from the mill filled all but the northern end of Cart Lake. In the early 1990s, the mill building and headframe were still standing. 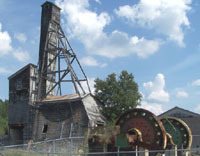 Subsequently, the mill has been torn down, though the ball mills, used for grinding the ore prior to processing, have been left, within a fenced in enclosure as part of the Heritage Silver Trail. The headframe still stands, though this tall, fragile looking structure is now supported with steel cables to keep it from falling over. The entire site is fenced to prevent public access. In 1979, a small area at the south end of the tailings, not far from the mill, was used as a test plot to experiment with revegetation methods. The ground for the test plot was graded, and drainage channels were dug. A layer of topsoil was then added to the plot, and after the application of fertilizer and mulch, the plot was seeded. Two different seed combinations were used to see which grew the best, and different soil thicknesses and fertilizer concentrations were also used. The experiment was not continued because a water line used for irrigation ruptured. By 1984, the vegetation had taken hold but had not spread. By the early 1990s, the vegetation was still healthy, but the area was getting smaller as wind-blown tailings slowly took over the test plot. Elsewhere on these tailings in the early 1990s, there was little vegetation growing, except along the edges of the tailings, adjacent to the forested areas, and along the tailings beach at the lakeshore. In the early 1990s, the sandy tailings from the mill, filling Cart Lake, were like a miniature desert. Like the Nipissing low grade mill tailings, dust from the tailings was a problem, especially on windy days. In addition, while much lower in arsenic concentrations than some other tailings in the area, these tailings were, nevertheless, a source of releases of arsenic to water. In 1995, the Cart Lake tailings were revegetated. Manure and organic matter were used to cover the tailings, prior to the addition of fertilizer and seeds. Today, like the Nipissing low grade mill tailings, the Cart Lake tailings look much better, and problems related to dust have been eliminated. However, as at the Nipissing low grade mill tailings, it is not known if this revegetation has had any impact on the releases of arsenic from these tailings. Future monitoring in the area should include water sampling in the north end of Cart Lake, to compare current arsenic concentrations with those reported before the tailings were revegetated.